Let it never be said Steven Soderbergh is one to fall in a rut. The filmmaker, who has taken retirement about as seriously as Hayao Miyazaki, is to some degree one of the most daring minds behind the camera working in the Hollywood system today. Looking at his recent filmography, and the sheer breadth of projects he's taken on, it's incredible to think that so many varying approaches to storytelling have come from one individual. The guy that made Magic Mike is the same guy that made Contagion, is the same guy that directed all of The Knick, is the same guy that lensed The Girlfriend Experience, is the same guy that masterminded the maybe a little too ambitious Mosaic. You get the picture. Anytime Soderbergh has something on his plate, there's no guarantee I'm going to like it - truthfully I probably dislike as many of his films as those I love - but they're generally going to be efforts that I'll appreciate. It's hard to not appreciate that kind of stretching of creative vision just sprawling out before us like this. 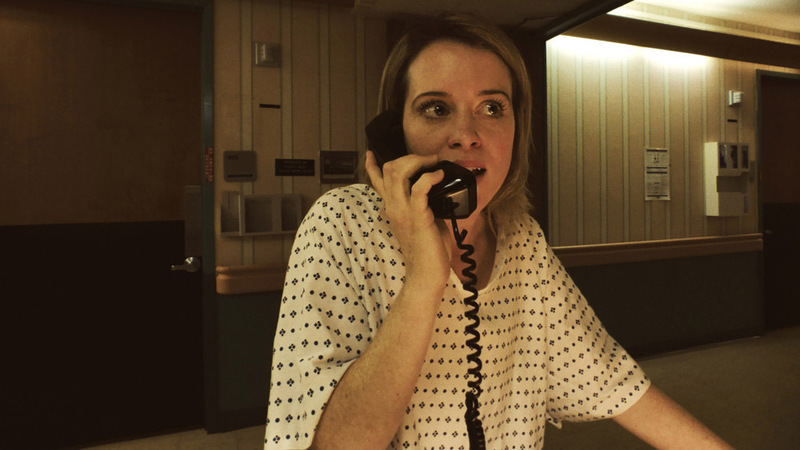 With Unsane, the expansion into new horizons is two-fold, the 55 year old filmmaker is embracing new technology (shooting the entire film on iPhones ala Tangerine) and a new genre - horror. In a category that is slowly starting to find its critical feet again, the always reliable Soderbergh taking a crack at it feels like a recipe for something well worth watching. Well, these things don't always turn out, do they? Unsane stars Claire Foy putting on a tremendously bad American accent to play Sawyer Valentini, a woman recovering from a serial stalker that has left her with a case of PTSD, and she begins to see him even in the random hookups she encounters on dating apps. She starts to seek out a support structure and signs up for a program intended to help her work through these troubles. Unbeknownst to her, what she actually signed up for was institutionalization that finds her locked up with individuals with far deeper mental impairments...or do they? And from there she discovers an even deeper systematic abuse that has far broader effects on just what this facility stands for, including an incredibly perilous personal connection for Sawyer, from where the much of the horror of the film lies. Unsane, thematically has two very good things going for it. #1) As stated on the tin, it shares some DNA with Soderbergh's earlier thriller Side Effects, which built its premise out of a look at how clinical trials can potentially be corrupted through dishonest practices. Unsane holds an equally critical eye towards another aspect of healthcare, this time the mental health field, as it tackles insurance scams by way of inappropriate inpatient practices. It's one of the most thought-provoking aspects of the piece itself, and leads a viewer to wonder just how often this may actually be occurring in the real world. #2) A slightly more timely theme, though perhaps a bit more abstract, is that Unsane is a movie built around how we as a society do not listen to women. It's a film built around the idea that a woman can be bound against her will, and anything she has to say to her defense is ignored as "the rantings of a troubled individual" and she is consistently muzzled either through being strapped to her bed, or heavily medicated. Though the most clear example of this is through the facilities' encroachment upon her past, and how again any voicing of discontent against this is completely disregarded. Both of these very strong premises are the ground zero for a movie meant to stir your emotions. The issue being, much of Unsane isn't terribly good. The moment to moment writing is a struggle to get through at times, and as the film progresses from its promising kick-off into its bigger twists and turns, and finally its denouement, it completely falls apart over that course of time and devolves into pulpy nonsense. I don't think there's a scene in recent memory that I cringed at more than the when Claire Foy makes Josh Lucas cry in a padded room...but it was at that point that I turned to Hannah and just shook my head at what we were putting ourselves through. Sometimes good performances can save shoddily written scenes, but therein lies the other trouble with the film, the acting is almost uniformly bad...amateur YouTube short bad in some cases. Foy is brilliant on The Crown, but her much broader theatrical essaying here is a total mismatch for the grittier material at the root of Soderbergh's vision and visuals. Everyone fares even worse to the point of much of the cast being unwatchable, Joshua Leonard's David Strine is particularly hall of fame awful. Poor Jay Pharaoh brings out what is the closest thing to a living, breathing character...but he's dealing with such bad material that it basically doesn't matter. There was so much promise here from the outset, but much like Side Effects, douses all of his most daring material with really dumb storytelling, and eventually, once the credits finally roll, that's all you're left with.